Aspiring communications experts in New York have a wealth of options available to them, from online courses to on campus programs. 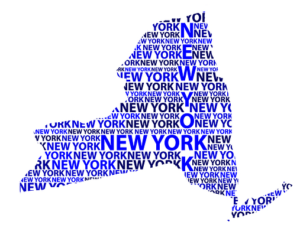 Several programs are available in the nation's media capital, New York City, while others are found around the Empire State. New York's major industries, particularly mass media, financial services, tourism, healthcare and retail corporations offer many exciting career opportunities for students graduating from master's in communication programs. See below for details about master's in communications programs available in New York. Ithaca College offers a Master of Science in Communication Innovation program as an online course of study. What to Know: The Master of Science in Communication Innovation is a 24-month online master's degree with 7 to 10 hours of work per week that can be completed when it is convenient for working professional students. What Does It Cost? : Tuition for the MS degree in Communication Innovation is $56,000, not including travel expenses for destination intensive courses. Students are permitted to divide tuition costs into four payments (one per semester) of $14,000. Anything Else? : Students choose five long-weekend destination intensive courses to supplement online learning, offered in various sites over the program's two years. Rennsselaer Polytechnic Institute in Troy offers a traditional on campus Master of Science in Communication and Rhetoric program. What to Know: The graduate program in Communication and Rhetoric offers a multidisciplinary curriculum in communication, culture, design and media. What Does It Cost? : Graduate level tuition is $51,000 per year for full-time students. SUNY in Albany offers a Master of Arts in Communication program that is accessible to both full-time students and working professionals with evening, online and hybrid courses. What to Know: The Master of Arts in Communication program prepares students for careers in communication professions within a variety of contexts: political, organizational, interpersonal, intercultural, technology and health. The program allows students to choose from one of the following concentrations: health communication, interpersonal and intercultural communication, organizational communication or political communication. What Does It Cost? : Tuition is $453 per credit for New York residents, and $925 per credit for non-residents. Anything Else? : The deadline for applications is July 15 for a fall semester program start, and November 1 for a spring semester start. SUNY College in Brockport offers a Master of Arts in Communication program in an on campus classroom format. What to Know: The Master of Arts in Communication program offers courses in the areas of interpersonal communication, organizational communication, mass communication and rhetorical theory and criticism. Because many students have full-time jobs outside of their studies, all required seminars in the program are offered in the evening. What Does It Cost? : Graduate tuition and fees for New York residents is $315.85 per credit hour, and $482.85 per credit hour for non-residents. Anything Else? : The deadline for applications for the fall semester is June 1, the deadline for spring is November 15 and the deadline for summer is April 1. SUNY College in Oswego offers a Master of Arts in Strategic Communication program in an on campus classroom format. What to Know: The Master of Arts in Strategic Communication program offers a flexible curriculum that allows students to select one of three tracks in the 34-credit program: Integrated Media & Social Networks, Health Communication and Organizational Communication. What Does It Cost? : The cost per credit hour is $453 for New York residents, and $925 for non-residents. Anything Else? : SUNY - Oswego reviews applications on a rolling basis. SUNY in Potsdam offers a Master of Arts in English and Communication program in an on campus classroom format. What to Know: The Master of Arts in English and Communication is an interdisciplinary program focusing on human symbolic systems and interactions. The program welcomes part-time students and most classes are scheduled in the evening to accommodate those with daytime employment. Anything Else? : SUNY - Potsdam reviews applications on a rolling basis. The 36-credit program generally takes 24 months to complete and begins in the fall semester. Syracuse University's Newhouse School offers a variety of master's level communications degrees. What to Know: Among the many master's level communications programs at the Newhouse School, students can choose from degree programs in advertising, arts journalism, broadcast & digital journalism, communications management, media and education, media studies, public diplomacy, public relations and television, radio & film. What Does It Cost? : Tuition and fees vary depending on the program selected. For more information about the current costs of each program, please visit the tuition and financial aid page. Anything Else? : The application deadline for the on campus master's level programs is January 15. For more information about these deadlines, please visit the admissions requirements page. Syracuse University's College of Visual & Performing Arts offers a Master of Arts in Communication & Rhetorical Studies program. What to Know: The Master of Arts in Communication & Rhetorical Studies program offers a strong academic research focus and is aimed at students who plan to pursue a doctoral-level education. What Does It Cost? : Tuition is $1,559 per credit hour for graduate students at the College of Visual & Performing Arts. Anything Else? : The application deadline is February 1 for admission in the fall. Buffalo's Canisius College offers a distinguished Master's in Communication and Leadership Program that is offered in an on-campus format. What to Know: The Master's in Communication and Leadership degree program allows students the choice to specialize in the following concentrations: organizational leadership, managing for non-profits, and integrated marketing communications. What Does It Cost? : Contact Canisius College directly for information on tuition and fees. Anything Else? : The program is not currently accepting new applications but may have offerings in future years. SUNY in Buffalo offers a Master of Arts in Communication program that is offered in a traditional, on campus format. What to Know: The 36-credit program focuses on the scholarly study of the communication process, with coursework focusing on communication theory and research methodologies. It is designed to be completed in two years of full-time study. What Does It Cost? : Graduate tuition and fees for New York residents is $13,383 per year, and $24,723.50 per year for non-residents. Anything Else? : The application deadline for students requesting financial aid is January 15. For all other students, applications will be processed until classes start in the fall. Baruch College in New York City offers a Master of Arts in Corporate Communication program in a traditional classroom format. What to Know: The Master of Arts in Corporate Communication program is designed for working professionals, with classes offered in the evenings and can be completed in three semesters. What Does It Cost? : The cost per credit for New York residents is $425, and $780 per credit for non-residents and international students. There is also an academic excellence fee of $500 per semester. Anything Else? : The MA in Corporate Communication is a 36-credit hour program that consists of six required courses and six elective courses, with classes taking place from 6:05 - 9:00 p.m.
Columbia University in New York City offers an Executive Master of Science of Strategic Communication hybrid program that combines online study with on campus classroom work. What to Know: The Executive Master of Science of Strategic Communication program is designed for experienced communication professionals and those in leadership positions in a wide range of industries who wish to become experts in communication. What Does It Cost? : Tuition for the Executive Master of Science program is $2,018 per point, which does not include fees, texts and course materials. A full summary of fees can be found here. Anything Else? : Each semester features a combination of multi-day intensive study, weekend classes and online activities and engagement. When not at Columbia, students access resources, submit assignments and communication via an online learning platform. New York University's Steinhardt in New York City offers a Master of Arts in Media, Culture and Communication in an on campus format. What to Know: The Master of Arts in Media, Culture and Communication program focuses on the study of global media and culture, digital media and new technologies, media history and theory, political communication and more. The 36-credit hour program can be taken full- or part-time. What Does It Cost? : Tuition is $1,660 per credit hour for graduate studies at NYU Steinhardt. Anything Else? : The deadline for applications is February 1 for a fall semester program start. Fordham offers a graduate level Strategic Marketing Communications program that is delivered in an online format. What to Know: The Master of Science in Strategic Marketing Communications program is designed to be completed in four consecutive terms. The curriculum includes courses on media strategy, crisis communications, consumer behavior, market research analysis, and more. What Does It Cost? : MS program tuition and fees for the 2018-2019 school year are $1,511 per credit for continuing students (started prior to Fall 2017), and $1,555 per credit for new students (started Fall 2017 or later). Anything Else? : While the coursework is delivered online, all students are required to come to New York twice during their program for residencies at leading advertising, PR, and marketing firms. Marist College in Poughkeepsie offers students two options for online master's-level communication degrees. What to Know: The online Master of Arts in Communication program can be completed in one year of full-time study or two years of part-time study, and culminates in a thesis or comprehensive exam. The Integrated Marketing Communication Master's program focuses on digital interactive marketing and strategic communication tactics, with courses offered in public relations, social media, marketing research, branding, strategy and global marketing insights. What Does It Cost? : Tuition for both online programs is $800 per credit hour. Anything Else? : Applications for fall enrollment are due by August 1. St. Bonaventure University offers a Master's in Integrated Marketing Communications (IMC) that is 100% online. What to Know: The Master's in Integrated Marketing Communications program can be completed in as little as one year - two seven-week courses per semester. The curriculum addresses topics such as creative message strategy, new media, and marketing communications research. What Does It Cost? : The cost to attend St. Bonaventure's IMC program is $24,915 total, or $755 per credit hour. Anything Else? : Students are able to customize their IMC program curriculum with two electives. Syracuse’s Newhouse School portfolio of programs includes a fully online Master of Science in Communication program; choose from three specializations: Public Relations, Advertising and Journalism Innovation. Anything Else? : The online program offers four start dates per year with differing application deadlines. For more information about these deadlines, please visit the admissions requirements page.